This is a joint giveaway with I Thought I Knew Mama and Natural Parents Network. You may enter at one site only. Please find the section marked “Win it!” for the mandatory entry and optional bonus entries. Baby Babu is offering our readers a giveaway of a $25 gift code to buy the Baby Babu cloth diapers of your choice. 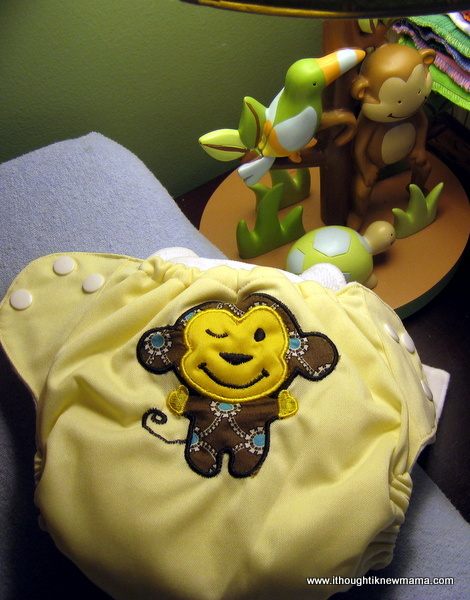 I recently had the pleasure of trying out one of Baby Babu’s adorable pocket cloth diapers – the THIS GUY’S BANANAS Monkey Pocket Cloth Diaper – and I am now definitely a fan of Baby Babu. Baby Babu is a company out of Melbourne, Florida started by the parents of twin boys. Their goal is to provide high quality, sustainable, and affordable diapering solutions for parents around the world. They offer everything from cloth diapers to biodegradable disposable diapers to various kinds of cloth diaper accessories like wet bags, inserts, and diaper covers. Baby Babu also offers free shipping on all orders, which I love. 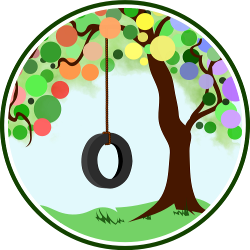 Their web site is a fantastic resource for information on cloth and biodegradable diapering. They cover topics such as How to Get the Ammonia Smell out of Cloth Diapers, What Do I Do if My Cloth Diapers Start Leaking?, and Pocket Cloth Diapers Explained. I really appreciate the design of this pocket diaper. It has a waterproof PUL cover, and the micro fleece inside of the diaper is so soft. It has double gussets and adjustable snaps to accommodate children ranging from 8 to 35+ pounds. My son is around 30 pounds, and the diaper fit him perfectly. It was snug enough to hold in everything that we didn’t want to see leaking, yet roomy enough to be comfortable. The diaper comes with a snap in, three layer, super absorbable insert made from micro fleece and bamboo fibers, and the two openings at the top and bottom of the diaper made it easy to add an additional insert into the diaper for overnight wear. The top and bottom openings also made laundry a more pleasant experience because the insert could agitate out during the wash cycle meaning I could avoid touching it. Notice the super soft and absorbable insert and the double gussets - a huge plus in protection against blow outs! I was happy with the way that the diaper washed. I pre-washed the diaper three times with cold water, and then followed the web site’s instructions for washing the diaper after each use. I pre-rinsed in a cold cycle, then washed the diaper in a hot cycle. I added an extra cold water rinse at the end and dried the diaper on low heat. We were able to use the diaper three times prior to writing this review, and so far, I have not seen any evidence of stains, and the diaper has maintained its softness and efficacy. A satisfied Baby Babu customer! I highly recommend the Baby Babu pocket cloth diaper to anyone who is looking for an easy and affordable way to diaper their children. You can’t beat the $11.99 price for a comfortable, efficient, and adorable diapering system! For your own chance to win $25 worth of Baby Babu products, enter by leaving a comment and using our Rafflecopter system below. The winner will receive a $25 gift certificate to spend on Baby Babu products of her choice. Contest is open to the U.S. residents only. MANDATORY ENTRY: Visit Baby Babu and tell us one thing you have learned about the company! You must enter your name and email address in the Rafflecopter entry system for your entry to count, after leaving a comment on this blog post. This is a joint giveaway with I Thought I Knew Mama and Natural Parents Network. You may enter at one site only, and we’ll be recording IP addresses to ensure that there are no duplicate entries. That said, please do visit and enjoy both sites! Contest closes July 9, 2012 at 11:59 p.m. Eastern Time. AUTHOR BIO: Charise Rohm Nulsen is the proud mama of a son born in June 2010 and a baby girl born in May 2012. She is also the author of I Thought I Knew Mama – a window into the adventures of stay at home mamahood, natural parenting, and green & healthy living.